At our cafe, people used to ask for banana bread a lot. As it’s not a really traditional Scandinavian thing, we wanted to make it our own with a ‘Scandi’ twist. So, we created this version with added rye flour to make it more wholesome. 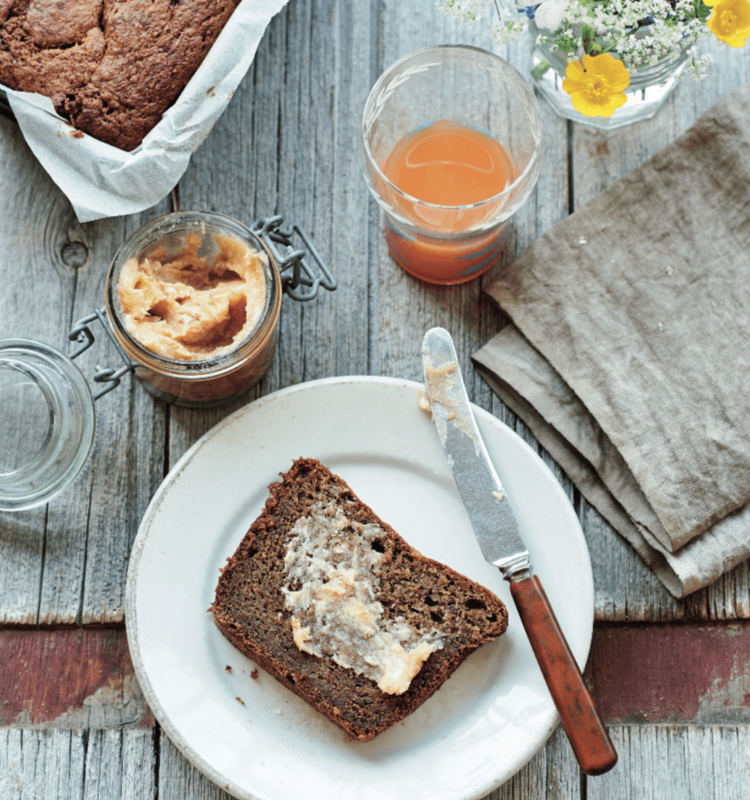 We like to serve it with a delicious cinnamon butter that just melts on slices of this loaf when toasted. In a stand mixer with the paddle attachment, cream together the butter and dark brown soft sugar. Meanwhile, mash the bananas and mix with the yoghurt, lemon juice and vanilla and set aside. When the butter and sugar are creamy and well combined, add the eggs one at the time, scraping down the sides of the bowl between each addition to ensure they are fully incorporated. Add the mashed banana mixture and mix until incorporated, then add the flours and mix briefly until smooth. Do not over mix. 30 minutes. – Check with a skewer – it is done when the middle just comes out clean. Leave to cool. Serve toasted with cinnamon butter (see below). Mix 3 tablespoons of strong cinnamon sugar (half and half) with half a packet of soft butter – re-chill and use as needed. A recipe from our new book ScandiKitchen Summer – out now, published by Ryland Peters and Small and available in all good bookshops.